Swooooon. Ted Muehling. Ohhhhh Ted Muehling. I saw his gorgeous tabletop designs in last year’s Feeding Desire exhibit at the Cooper-Hewitt (and in the museum’s shop) and then came across these photos for them on E.R. Butler. Everything he does is so graceful and is inspired by the graceful forms of rocks, shells, eggs and insects. Absolutely stunning. For those of you in New York, his store is downtown on Howard Street. Moon Snail Bowl, pictured in shell pink, $1,470. Salt and Pepper Snails, $130 each. 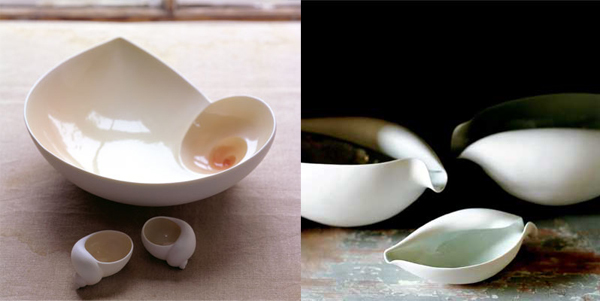 Volute Bowls, pictured in celadon, $1,610. Oh my gosh! What Beautiful things this man designs. Thanks for sharing! you are a rockstar priya for sharing this link. I just got to your blog and I adore it! I love all the beautiful things you have to show and I am sometimes completely stunned by the wonderful aesthetics they own! Those are great ! So organic but still so rigid. these are so beautiful and delicate. great find.